What’s the worst about when Christmas and New Year are over? 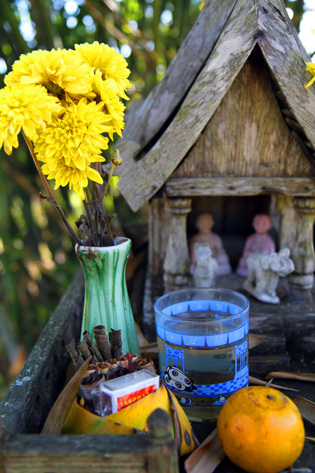 Not the end of the binge-eating and binge-drinking (hell, you can continue with that, no problem)! No the bad part is that there’s a whole few months of grim winter left to get through (without the joy of cinnamon-scented everything). So, what to do? Well, just get the heck away from it all! I decided to ditch the terribly depressing British January and escape to warmer climates. 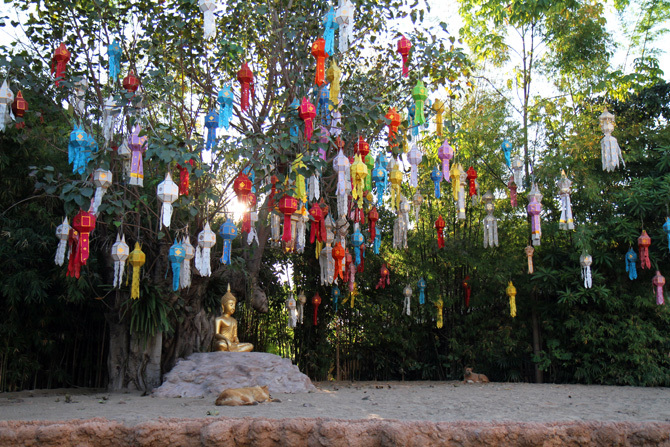 The destination: Thailand and Cambodia. Instead of freezing in grey-skied Britain and having to put up with moody Londoners cursing the weather, the tube, the tourists and anything else in their lives, I got to indulge in 30 degrees heat, explore foreign lands and eat my way through the most amazing South East Asian dishes! Not a bad move, ey?! 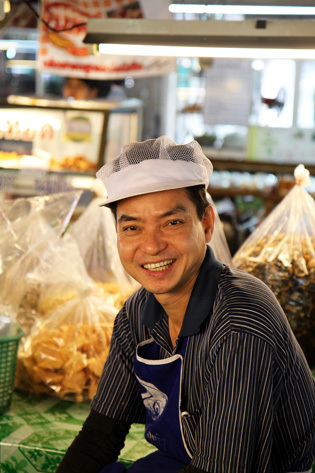 My first stop was Bangkok. Brilliant city! Most amazing place! 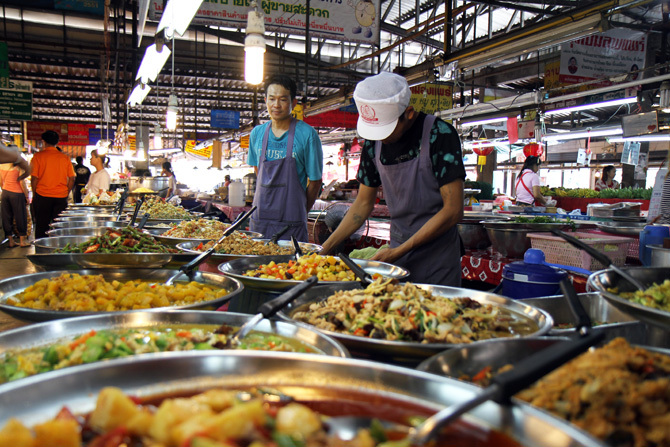 If you ever want to die from over-stuffing yourself with street-food, go to Bangkok. 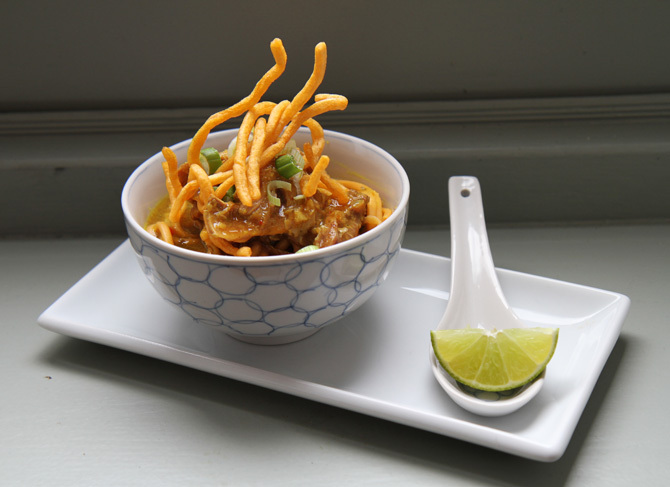 I’d happily have my stomach burst from Pad Thais, Som Tams and Thai fried chicken. 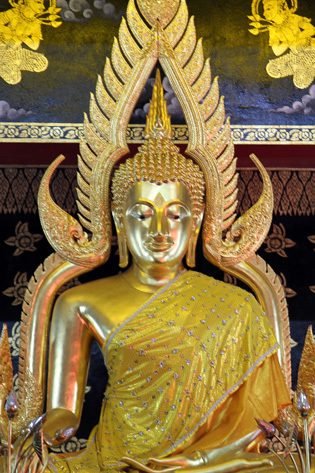 Anyway, this post is not about Bangkok though, this one focuses on the other fantastic Thai city of Chiang Mai. 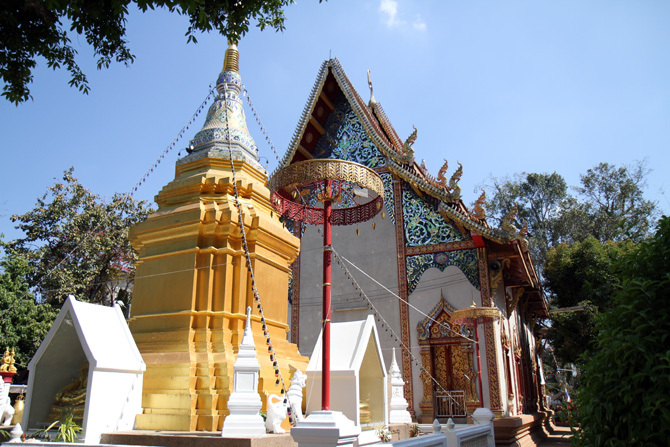 Chiang Mai is in the North of Thailand, in the more mountaineous part of the country. 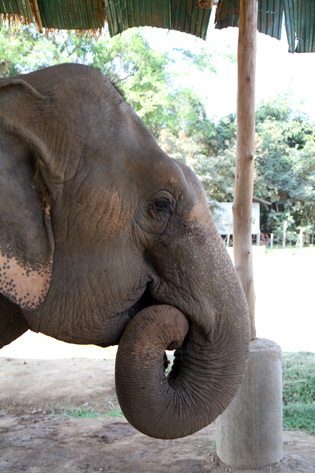 It’s famed for its beautiful temples, its elephant nature resorts and foremost for its food… Yeah, now you know why I went there! 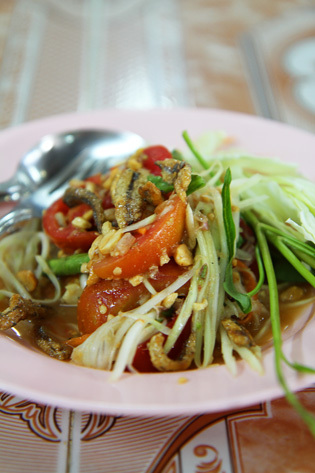 Chiang Mai is in fact the culinary capital of Thailand. 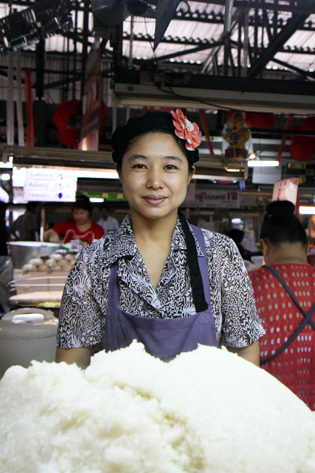 For those of you in the UK who watch Masterchef – it’s where this year’s contestants had to cook their way through the markets, temples and hotels. Amazing city! Amazing food! 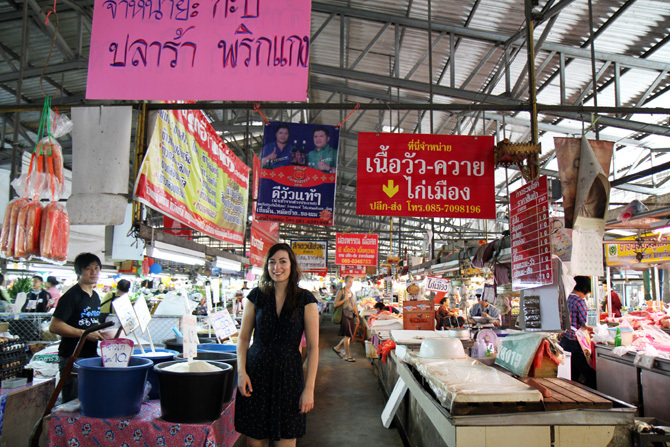 We started our stay with trips around the local markets, discovering wonderful – and really weird – stuff…. 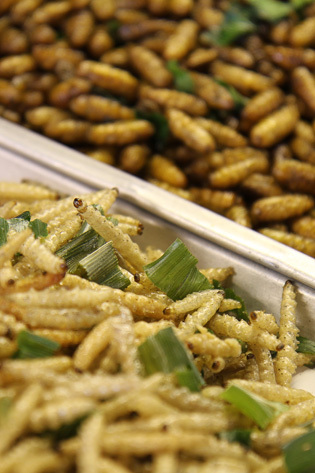 Ever eaten grubs and maggots? No…? Really…? Why not…? Well, me NEITHER!!! It’s my worst nightmare to ever get in direct contact with a maggot! These funny-looking insects truly freak me out! Something about them not having any legs, and doing these weird winding movements really seriously deeply disturbs me! So, can you imagine what it was like seeing some deep-fried maggots lying on a stall (next to some lovely smelling curries and yummy sausages)?! Freak out! Still I managed to calm myself down and stop myself shaking so that I could take a (partly-focused) photo of these beastly food insects! Now, wanna find out the really freaky bit about these maggots??? Yeah, go on, you want to! So, let me tell you that apparently (and I say apparently because you will really never find me doing this – ever!) 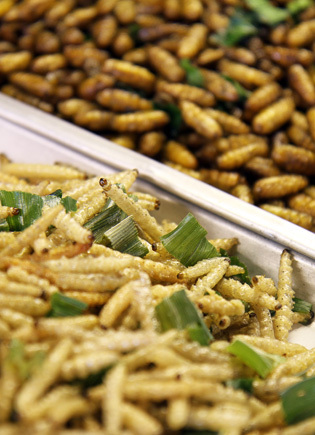 these deep-fried looking maggots are not crispy! Apparently when you bite on them, they pop open and are full of mushy mush!!!!! Arrrrggghhhhhhhh!!!! Anyway, enough disgusting stuff on Anne’s Kitchen! This is supposed to make you hungry, not want to reach for a bottle of whiskey to drown traumatic information. So, over to some nice stuff. 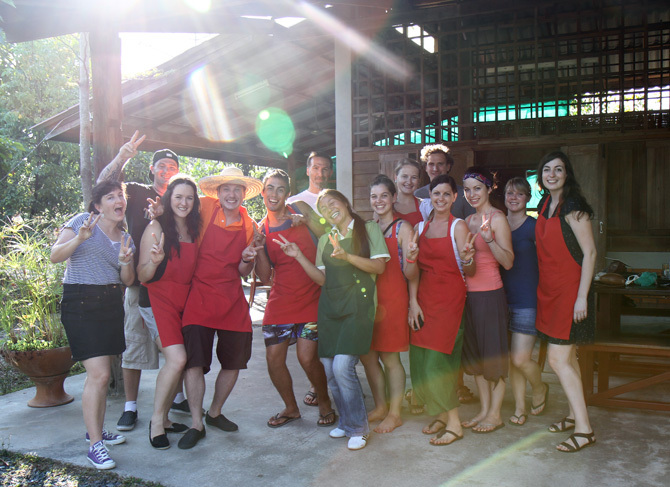 One of our days was spent in the amazing Thai Farm Cooking School. 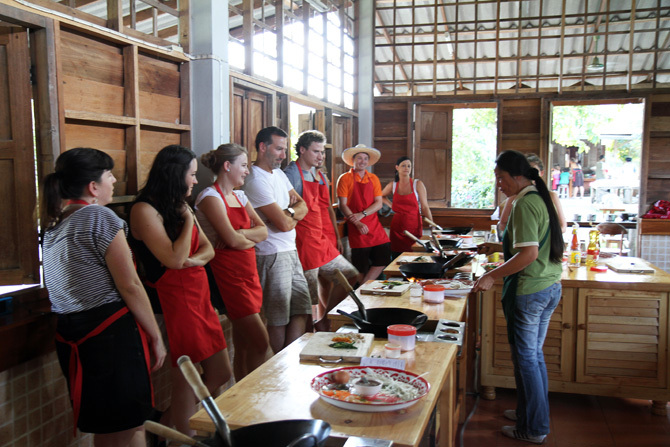 After a trip to the market in the morning, we headed to the cookery school, housed in open bamboo huts. 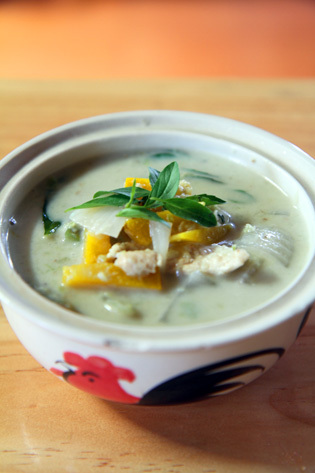 We learnt how to make Thai soups, curries, noodle dishes and desserts – all in really relaxed and fun surroundings. Our cookery teacher was slightly nuts by the way. She couldn’t be serious for just one single minute – everything, everything had to have sexual references. Chilies were “good for your man” *wink*, pounding the curry paste turned into a competition to see who’s the “woman who makes their man the happiest”, and later on she asked all the men to start “massaging their noodles” with soy sauce! All accompanied by heaps and heaps of giggling. As I said, completely nuts! 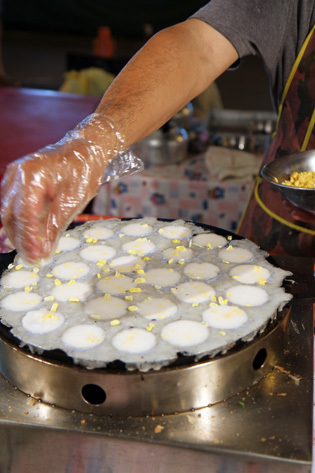 In case you’re wondering what these round “cakes” are, they’re khanom krok the most delicious thing ever! We discovered them on one of Chiang Mai’s night markets. It’s in fact a coconut custard, that’s poured into these round holes. They then sprinkle adzuki beans, sweetcorn or chives on it and let it cook for a while. 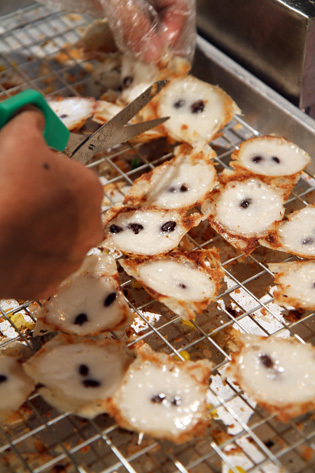 The bottom of the custard ends up becoming crispy, while the middle is still gooey. It’s just unbelievably yummy. I’d love to be able to recreate this at home, but wouldn’t know what mold to use… Maybe a waffle maker? 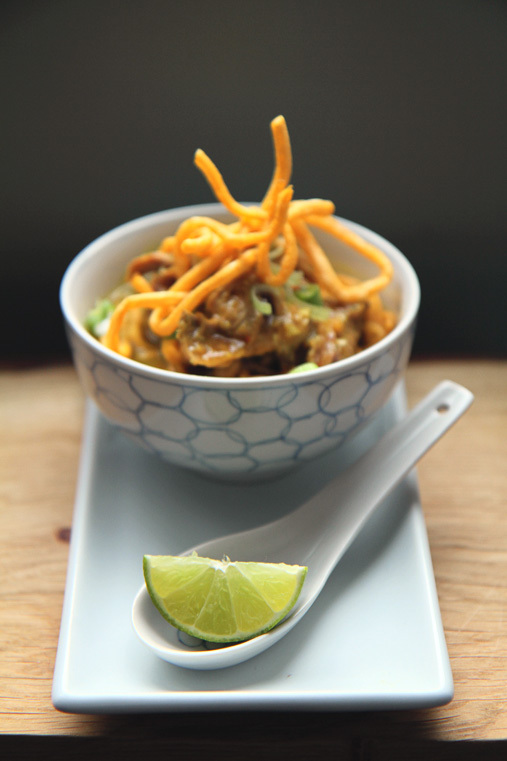 So I’ve come back full of inspiration, eager to try out these fabulous dishes at home. Fortunately I’m lucky enough to live in London, where I can easily get hold of even the most obscure ingredients. You’ll regularly find me rummaging the shelves across Chinatown these days. 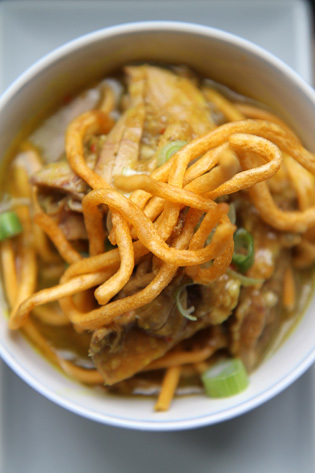 One of my favourite dishes in Thailand was Khao Soi – a Northern Thai curry, made with egg noodles and chicken. 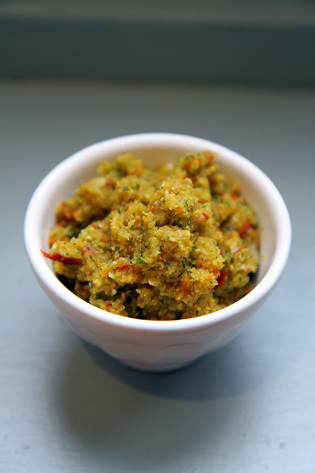 It’s not as spicy as the typical Thai curries, made with green or red curry paste. This one is far gentler and more subtle in taste. 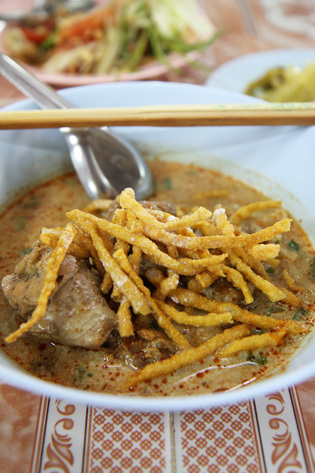 Khao Soi is traditionally eaten for lunch around Chiang Mai. So, why don’t you try it at home? It’s far less daunting than you’d think. 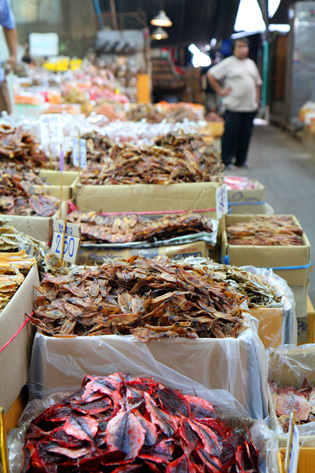 Just set a couple of hours aside, go shopping at your local Asian grocery and just try it! It’s so incredibly simple, but so incredibly wow! I finally got a well-deserved break from all the stress in London…. Looks absolutely amazing. My boyfriend and I are currently planning a 2 year backpacking trip through Asia and Europe to start later this year and I’m incredibly excited for all the food and cooking schools in Asia. Would you recommend the cooking school you went to? Hey Vicky! I can’t believe you’re planning on taking a 2-year-backpacking-trip!!! (*jealous*) How amazing! 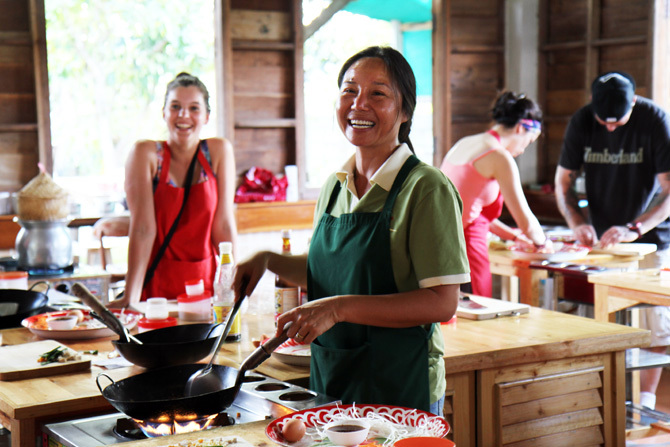 You have to stop by at the Thai farm cooking school, it’s incredible, really such a lovely experience! Let me know when are in London and I’ll give you some local tips here too! All the best to you and your boyfriend! 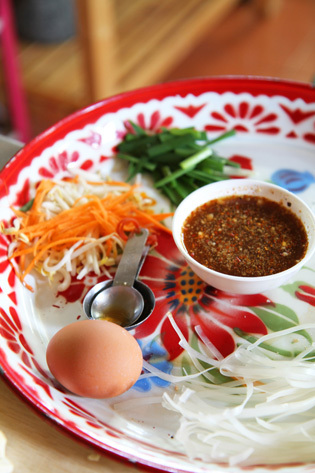 But thanks for the tip about the Thai farm cooking school and I would LOVE any and all London or England based tips or advice!! 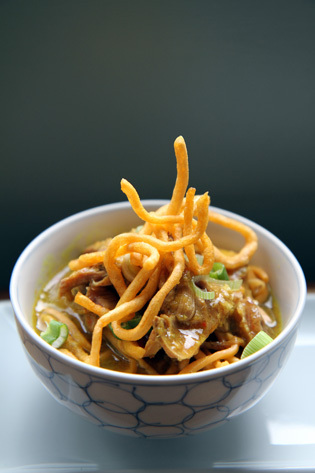 I love Khao Soi. 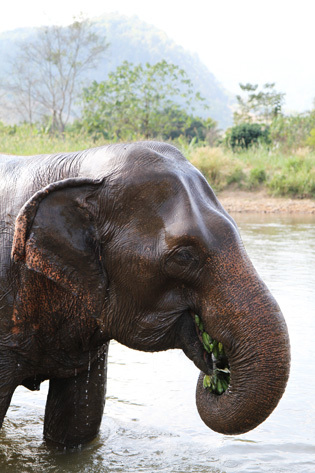 I was Thailand for two weeks last summer. I’ve been trying to recreate this ever since. you do mean coconut cream and not coconut milk right? and do you know the oz of the can you use? 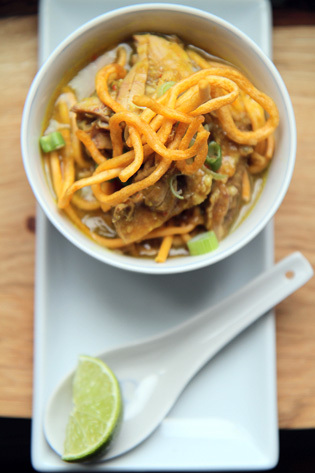 Hi Caleb, I hope you like the result of this recipe, it’s quite labour-intensive, but so is every proper Thai curry 🙂 I do mean coconut cream, but if you can’t get hold of that get coconut milk (the curry will be slightly less creamy in that case). Let me know how it goes! thanks for the reply! But do you know the exact measurements of the can? You see, I always make my own coconut milk/cream. 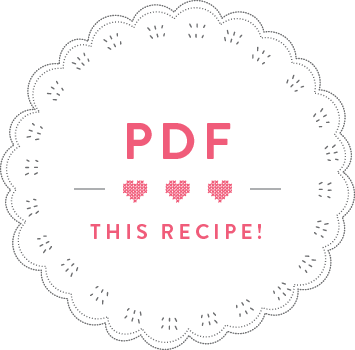 and so I need to know how much to make. thanks. Hey Caleb, yes it’s 400ml so that should be 13.5oz. Being a big curry aficionado, I thoroughly enjoyed this article (and share your sentiment toward eating insects… unthinkable :P). 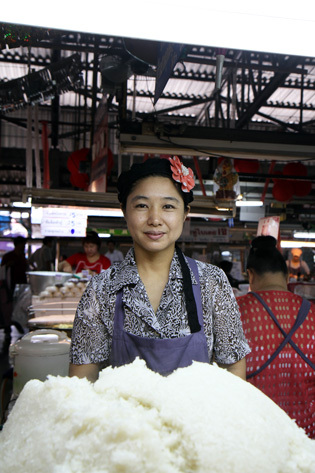 An enticing story interwoven with captivating images, it was my palate’s passage to Thailand!